I thought I would post this little tip as it is so nice not to have to muck about with solvent and medium cups and bottles. I got these little bottles as the art store for under $2 and use them to keep my mediums, mineral spirits and walnut oil right next to my palette. As they are squeeze bottles there is less room for air if kept squeezed out of the bottle. 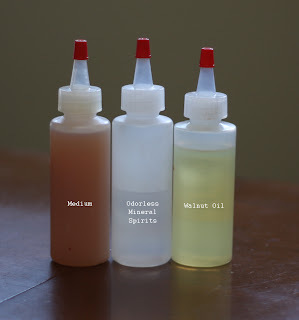 Also it is nice to have the mineral spirits in the squeeze bottle so I don`t have to worry about the fumes (my studio is in my home and I have kids so the less fumes the better). The walnut oil I keep as well mostly just for cleaning out my brushes between colors, much easier on the brushes than using mineral spirits.